In a small bowl, mix together oil, vinegar, sugar, salt, pepper and chicken flavor packet from Ramen noodles and set aside. Chop head of cabbage and slice onions. Put in a large bowl. Crush Ramen noodles and add to cabbage. In a small pan, brown sesame seed and almonds in butter. Add to cabbage. 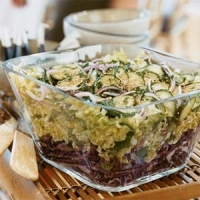 Pour vinegar mixture on top of cabbage and toss. Marinate in refrigerator overnight. 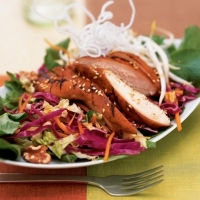 Recipe categories: Salads, Vegetables, Chinese.